Will Iraq&apos;s borders change — again? Oil, natural resources, religion and history are all powerful attractions compelling many parties to fight for a hand in Iraq. From the Islamic Caliphates to today&apos;s Islamic State of Iraq and Syria (ISIL) terrorist group, the country has a long history of contested ground control, showing how volatile it is. In history again and again, the easiness of taking swaths of land in Iraq has been shown. If one can do it, the other can. From the Islamic caliphate to the Ottoman Empire, from Kurdistan to ISIL, it has been proven how easy it is to take Iraqi ground. Borders are a societal invention; would the British imposed borders be to blame for the crisis occurring? A country&apos;s borderlines help establish a political state and ensure national security. It also creates nationalism — but nationalism does not wash away sectarianism, conflict and power struggles. Today&apos;s situation makes one wonder if borders matter. With Kurdistan&apos;s history of holding its ground despite society&apos;s belief in borders and war games in the neighboring Syrian conflict, territorial disputes were apt to erupt in Iraq. And they have. The Islamic State of Iraq and Syria, on a violent mission to establish an Islamic state, has swept from its strongholds in Syria through major cities and massive northern regions of Iraq in the last week. With the help of other Iraqi rebels, it is nearing the capital of Baghdad and working toward its mission. As ISIL is getting closer and closer to realizing its goal of capturing territory and possibly establishing an Islamic state, it is breaking down the Iraqi state. 1. Part of the Islamic Caliphate. An expanse of land ranging from Western North Africa, up the Mediterranean Sea to the Black Sea and over west to East Asia and down the Arabian Peninsula belonged to the Islamic caliphate. Led by Islamic leaders (Caliphs), the control over land grew century by century from the 600s to just before the year 800. The Iraqi state was unknown of during this time period. The Euphrates and Tigris Rivers attracted many to the Mesopotamia region. Mosul and Basra were — and still are — two highly frequented cities. If the Islamic caliphs could take all this land, it showed that it was possible for others to follow suit. Turkish tribes came next in the Ottoman Empire, and then European powers came afterward. 2. Life under the Ottoman Empire. The Turkish control over the Middle Eastern region took massive swaths of land in the 1300s leading up to the 1500s. This historic map shows that the tribes had taken Syrian land and northern Iraqi ground in its first effort. A later expansion under Suleiman the Magnificent in the 1500s captured the rest of Iraq. Seeing how easy it was for the Islamic caliphs to take land, the Ottoman Empire took advantage of that volatility and fought to take it all. 3. Borders drawn under Colonial Rule. The Ottoman Empire ended in 1922, overtaken by the Turkish Republic, placing Iraq under the rule of Turkish tribes for nearly 400 years. Next came the great influence of colonialism as Europe superpowers came into play by way of World War I. In order to reap the benefits of natural resources and oil in the region, the British had taken over and occupied Iraq and neighboring countries Jordan and Kuwait. The borders of Iraq were formed under British rule through several negotiations, concessions and the League of Nations. A mandate imposed under Britain established the borders of Iraq and the Kingdom of Iraq in 1920. Eventually, Iraq gained independence from British rule in 1932. With the creation of borders and independence, it didn&apos;t bring the end of border and territorial disputes in Iraq. 4. Kurdistan becomes an autonomous region. Kurdistan, a disputed region lying across multiple countries, captures a large and devoted population of Kurds sharing a strong culture, language and identity. It has a territorial and populational presence in Turkey, Iran, Syria and Iraq. The power of the Kurds threatened to redefine Iraq&apos;s borders. However, Kurdistan was confirmed as an autonomous region in the northwest of Iraq with its own regional government in 1970. It has been peacefully on its own since. 5. The Middle East and North Africa before the revolutions. The Middle East and North Africa, before the sweeping 2011 uprisings, on a map is what we know today and take for granted across the globe. The region is impacted by several divides that go beyond borders. The societal invention of mapping countries creates nationalism, but today&apos;s brewing conflicts show the great power of both politics and religion and how they can triumph borders. 6. 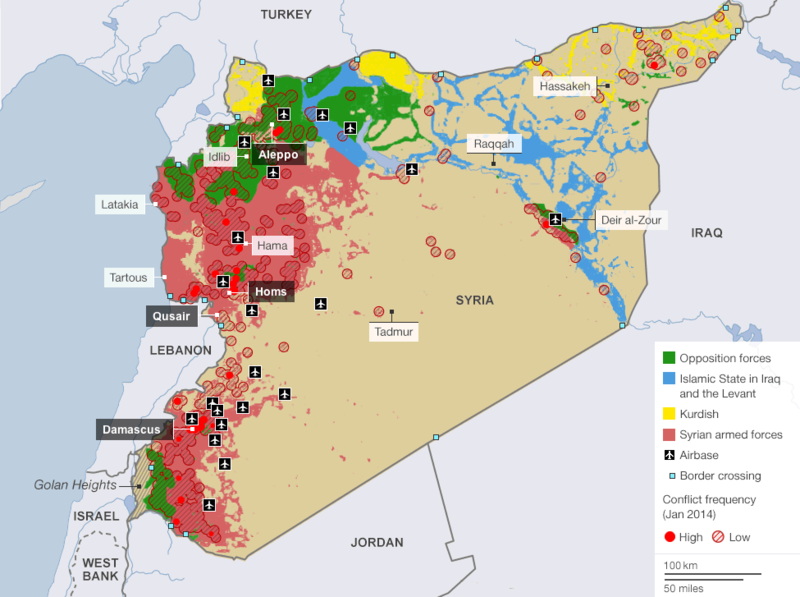 The crisis in Syria sets the stage for shifting borders. The Syrian war has spilled over from its country&apos;s boundaries into neighboring states, and Iraq is one. It&apos;s almost as if New York Times&apos; Robin Wright predicted the territorial divides in Iraq, as well as Syria and the rest of the Middle East, in his "How 5 countries could become 14" piece posted last fall. Wright predicted in Iraq, "Many central areas, dominated by Sunnis, [could] join Syria&apos;s Sunnis. And the south [could] become Shiitestan." He essentially foresaw the Sunni and Shiite split in Iraq, not knowing or naming a group such as ISIS in his prediction. He said, "It&apos;s not likely to be so clean." 7. ISIS Captures Fallujah and Mosul. ISIS took Fallujah, just west of Baghdad, in January of this year. It was a bold move by the insurgent group who had most of their operations and territory in Syria. ISIL&apos; next move was the push into and occupation of Mosul, in the north of Iraq, this June that surprised many across the world. Kurdistan is even taking advantage of today&apos;s crisis by looking at it as an opportunity for its region. They&apos;ve taken back disputed areas and essentially created new borders for its autonomous region in Iraq. After ISIL took Kirkuk in the northeast, Kurd forces took their coveted city back. ISIL has not challenged it, leaving Kurdistan alone. "Currently our border is with ISIL, it is not with the Iraqi government,” Jabbar Yawar, Secretary General of the Kurdish Ministry of Peshmerga said to Reuters. ISIS and Kurd forces have gone about their own ways, even creating a 1,000 kilometer border region between the two states. 9. Setting the stage for the Islamic State of Iraq and Syria. And now, Iraq is here in this position today where it is currently controlled and divided by three forces. The Islamic State of Iraq and Syria has the north and has been sweeping south toward Baghdad, while Kurdistan has regained Kirkuk and maintained its stance. Prime Minister Maliki has stayed put in Baghdad, defending his Shiite support in the capital and the south. The situation is still developing and it is impossible to see if this is the new status quo — an Iraq with an Islamic State, a united Kurdistan, and a Shiite South. Only time will tell. History is being made each day.